Since Frozen Free Fall, Disney has been very successful in attracting youngsters with its simple yet addicting match-3 games. 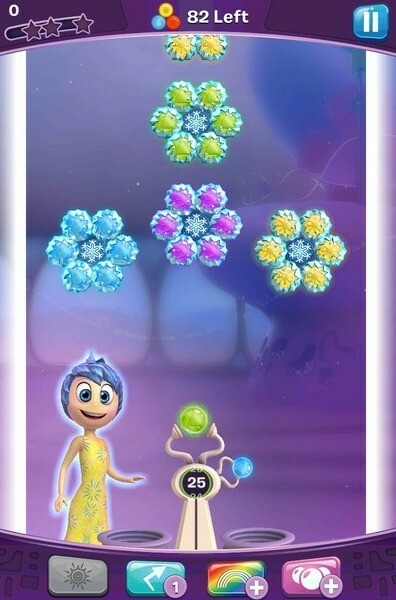 Inside Out Thought Bubbles is the newest bubble shooter game in the list of animated movie-themed games. 1. In this game, objectives range from clearing memories to rescuing mind workers to hitting all targets. You will need to fulfill objectives before you run out of shots. Remember that there will be limited number of shots, so try removing maximum thought bubbles in one shot. To do this, look for bubble matches that can knock off a cluster of memories below them. You will find many such clusters that hang on to a few memories. Just aim and target these memories to get rid of thought bubbles clinging to them. You can use the Sadness power up to knock off several thought bubbles all at once. When starting a level, choose this power-up. Clear blue memories first to charge the Sadness power-up meter. Once fully charge, target those thought bubbles that have a cluster of memories clinging on to them. 2. Clear all thought bubbles shown on the screen to make way for new bubbles. Focus on removing the front ones first. Target the top bubbles only when you can see a potential match that can knock off memories below them. In skill levels, where you have to hit all targets, make sure you take out all visible targets on the game screen. New targets will start appearing only when the current lot is removed. 3. In “Avoid the Line” levels, always try to remove the front section as soon as possible. The grid drops after every third shot. If it touches the line, it’s game over. Get rid of the front portion of the grid. You may use Joy’s power-up to clear the front section or Sadness power-up to get rid of the entire bubble cluster by targeting the bubbles above the bubbles. 4. Clearing memories surrounding the brain freeze center smashes it, making way for new bubbles. Frozen memories don’t fall into the test tubes below, so better smash them as soon as possible to clear the path for more thought bubbles. Just make sure your shooter bubble doesn’t touch the brain freeze center, else it will be frozen as well. Match all blue bubbles to fill the sadness meter. Once the meter is full, tap on the power-up to load the special bubble. The special bubble will rain down sadness memories turning all bubbles into blue bubbles. Sadness unlocks at level 15. Unlocks at the start of play. Match yellow bubbles to fill the Joy meter. Once charged up, use the joy bubble to clear a group of memories belonging to any color. There’s no need to match colors as the special bubble will turn all bubbles into yellow once it comes into contact with them. The yellow burst clears a section of thought bubbles and can be extremely useful to clear brain freezes. The Anger power-up can be unlocked at level 51. Clear red bubbles to fill up the Anger meter. Once filled up, tap on the power-up to load the special Anger memory. It’s actually a fireball that goes in a straight line, destroying all bubbles that come into contact with it. With this power selected, your aiming line will become longer. Use it to get to hard-to-reach areas. With the extended aiming line you can even aim at the top to see where the bubble will finally hit. The power can be quite useful for shots off the side walls and the top wall. Matches all memories of the same color. For Example: If the rainbow memory comes in contact with a yellow memory, then all yellow memories on the screen will be matched and removed. With Extra Choices loaded, you will be able to choose 4 shooter bubbles instead of 2. Usually you can switch to another shooter bubble. But with this power, you there will be 4 bubble choices. 7. Keep practicing shots off the wall. You can reach areas where there might be a big match opportunity. Inside Out Though Bubble’s aiming line is quite good and you can easily bounce off walls to angle your shots.